Want a like-new shower door but aren’t thrilled with all that scrubbin’? Request your shower door special today and save 65%. But hurry! This discount only lasts as long as our we’ve got open appointments. Your shower door can be a great reminder. At its worst, a shower door can remind you just how far behind you are on your to-do list and how overwhelming day-to-day adulting can be. It can remind you that you need to schedule your house cleaning for the month, or that you forgot to buy water softener salt, or that you really should be squeegeeing after every shower. In short, spending a little bit of time cleaning up your shower doors can make a huge difference in the everyday trenches of adult life. Glass polish applicator. Old synthetic bristle paint brushes work well. Glass polish mixture tub. Long, shallow Tupperware tubs work well. This one is pretty darn simple: anything inside the shower or tub that you don’t want to clean later should be covered with a drop cloth. Plastic, cloth, plastic-lined cloth...it doesn’t really matter. Just keep all the overspray and other nastiness off your tub, hardware, walls and ceiling, and you’ll be a lot happier at the end of this project. This is where you’ll start to see what you’re really up against. Anything left on the glass after this cleaning will need to be polished away. Cue “Eye of the Tiger” and get pumped. You’re about to see some results. Fill one bucket with your glass cleaning solution and one bucket with plain water. Our preferred solution is 1 oz. of janitorial strength ammonia per gallon of water, plus a dash of dish soap. See our post “What’s your favorite glass cleaning solution” for other great ideas for glass cleaning solutions. Now wet the glass with your sponge or strip washer. Running a sponge around the edges of the glass makes sure that you’ve gotten into all the crevices around the corners. Only scrape in one direction; NEVER drag the blade back and forth across the glass. Next, re-wet and quickly squeegee the glass, paying little attention to lines or spots you leave behind. You’ll be polishing and cleaning again after this, so getting too OCD would be a waste. Before you get started, set up a small workbench to hold supplies and gear nearby, and to keep other parts of your bathroom from getting messy. Covering a toilet tank or vanity with a towel works great and saves space in small bathrooms. Mixing your polish is as simple as wetting ½ or ¾ cup of BKF with ¼ cup water and stirring it together using your finger or an old paint brush. Just like Goldilocks’s porridge, it should be not-too-thick, not-too-thin. Aim for something about the consistency of ketchup. Apply the catsup-ish mixture to the glass, working in areas of about 1-3 square feet, depending on the severity of your hard water deposits. Heavier deposits should be dealt with in smaller areas, while light deposits can easily be managed in bigger chunks. The more methodical you are about polishing, the better your results will be, so start by scrubbing the edges of the glass (being careful not to scratch the frame or any hardware), then proceed to work the middle of the glass. Whether you use horizontal or vertical strokes won’t matter, but you should take care to work from the top down. Applying even pressure across your polishing pad, using straight strokes instead of circular, and overlapping your passes by about 1” will help you screb more aggressively and make sure that you don’t miss any spots. Once one section is free of those damn pesky hard water spots, do a shot. Then proceed to the next area. If you’re finding that your arm is about to fall off from fatigue, it may be time to consider bringing in the power tools. Check out our Glass Polishing Methods Deep Dive post for more info. When the entire shower door is polished, take two shots, then clean up. Again working from top to bottom, use a sponge and plenty of clean water to remove as much of the polishing mix as possible from the glass and any surrounding areas like the frame, tub or walls. Using the process detailed in our How To DIY Your Window Cleaning Job post as a guide, give your glass one final cleaning. Liberally apply your cleaning solution to the glass, making sure to work it well into the corners with your sponge. Squeegee the glass from top to bottom using straight pulls overlapping your passes 2-4”, and stopping if you encounter any obstacles like door handles or hinges. If you stop your stroke in the middle of the glass for any reason, you should use only horizontal squeegee strokes to finish the rest of the door. This way, you’ll avoid leaving a random line in the middle of the glass. When you’ve finished squeegeeing the glass, use a clean, lint-free rag to touch up any lines and spots, and to detail the edges. All your work up to now will be worthless in a few months if you don’t seal your glass and prevent those hard water spots from getting a foothold on your glass again. Using Rain-X or a similar glass sealer, follow the package directions to apply an even layer of sealer on every square inch of glass. To ensure total coverage, try two coats of sealer. Apply one using vertical strokes, allow to dry, then apply another using horizontal strokes. Admit it, you’re going to miss those damn hard water spots. But like a bad lover or a good salesman, they’ll be back in your life before you know if you don’t maintain a certain level of vigilance. 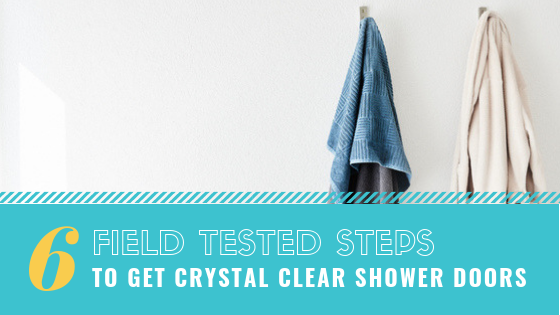 The most important thing you can do to keep your glass crystal clear is to squeegee after every shower. This will remove the water along with the soap and minerals its holding that otherwise clog the pores of the glass and cause deposits to form. Every so often, you’ll notice that your sealer isn’t doing a very good job anymore. When that happens, simply mix up a small batch of polish, grab your steel wool, and scrub away any debris on the glass, then re-coat. Restoring shower door glass that has been corroded by hard water deposits is hard frickin’ work. But with the right tools and some basic supplies, plus a bit of time and elbow grease, you can take your shower door from cloudy mess to crystal clear in a short amount of time. Your shower can be one of the most intimate, relaxing spaces in your home, but if it’s a nasty mess, you’ll likely never enjoy it for the sanctuary it is.